Life With a Whisk: A breakthrough. Bundt cakes were among the very first things I attempted when I was still testing the waters with baking. My cousin, seven years my senior, had joined a sorority when she started at UCLA -- one that had reputation for always offering good food at their events and, appropriately enough, had their own sorority cookbook, economically bound with those black plastic spirals. This was their arsenal, the recipes that would make beer-guzzling men weak in the knees. Some time into her first year, my sister tried the leftovers of one of the Kahlua cakes from an event and could not stop gushing about how much she loved that cake. Turns out, at its heart was a box of yellow cake mix, but with a few bells and whistles (i.e. the addition of vanilla pudding mix, a generous cup of Kahlua, etc. 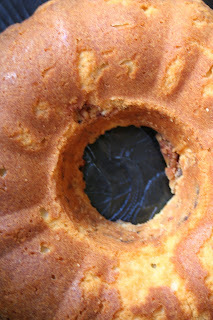 ), it became a pretty special and crowd-pleasing bundt cake (as can be expected with a sufficiently boozy pastries). You'd get a kick just from sniffing the finished product. This recipe made the rounds to my own events countless times while I was in high school, and eventually, we outgrew that cake and started making cakes without boxed mixes! No one really turns down a bundt cake, but this style of cake just doesn't excite me like it used to. They're almost always universally appealing, which isn't at all a bad thing to be, but it has been starting to feel like if I've made one bundt cake, then I've made them all. It was with this attitude that I baked this week's Tuesdays With Dorie choice of Nutty, Chocolaty, Swirly Sour Cream Bundt Cake by Jennifer of Cooking for Comfort, and expected to have a perfectly decent bite for dessert. I was completely, and pleasantly, surprised. 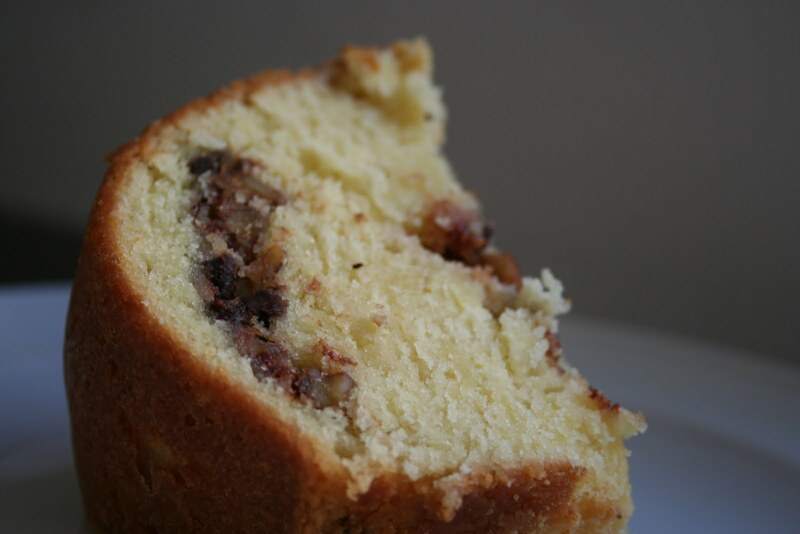 Rugelach are among my favorite baked goods in the world (and one of my favorite Dorie recipes) and this cake, predictably buttery like a pound cake, also has a tang from sour cream, creating this base with a taste that is completely reminiscent to rugelach dough. I left out the orange zest and raisins because I knew the other people helping me eat the cake would object, but the cinnamon, chocolate, and walnut ribbon throughout the batter re-created all the flavors I love about rugelach. (The addition of orange zest and raisins would still conjure up the same sentiment, I'm sure.) Warmed up in the toaster oven, the crust of the cake becomes a crisp, wafer like shell, and irresistible. Sour cream bundt cakes may not ever be en vogue again, and they rarely disappoint, but, everyone, I have found my new favorite bundt cake/coffee cake, and I know it as Rugelach Cake. It was a surprise wasn't it? I feel the same way though, if you have tasted one bundt, you have tasted them all. Fortunately for me, I love a bundt cake. :) Yours looks delicious. Im glad you liked it..it's my fav. bundt cake of all times..I call it Coffee cake!! i just tweeted last night how i need a bundt pan! but now i've decided that you can just back this bundt for me and i'll be perfectly satisfied :) i can almost taste the chocolately cinnamon walnut ribbon swirl now!